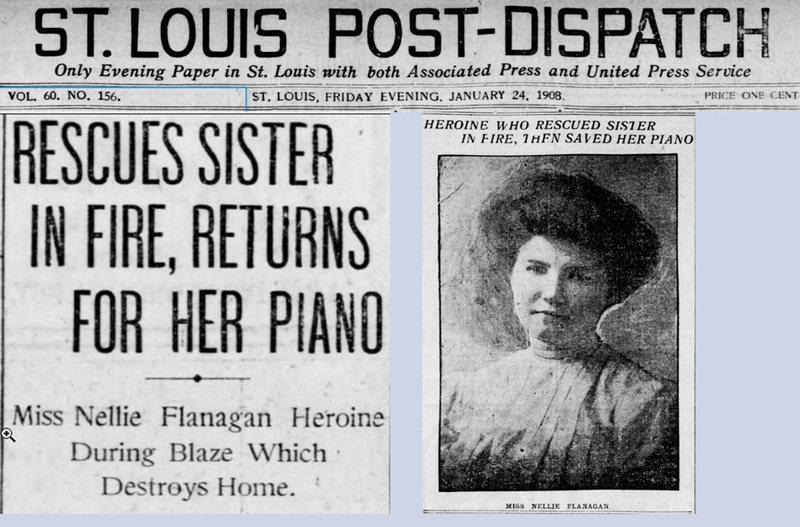 It was a family legend passed down from my grandmother Catherine (aka Kitty Mom) through my mom: Nellie loved music so much that, when their house caught fire, Nellie pushed their piano onto the porch, out of harm's way. It was in the newspaper. Sporadically, for more than ten years, I searched for the evidence. Yesterday, the data dragon decided to grant me a gold nugget... and the legend became fact. Here's the article, along with some fact-checking. The weather report on the same page lists the 6 a.m. temperature as 14 degrees. >>> The seven children lived with their widower father Moses Flanagan, an Irish immigrant and cabinet-maker, who worked as a foreman in a planing mill (think lumber). 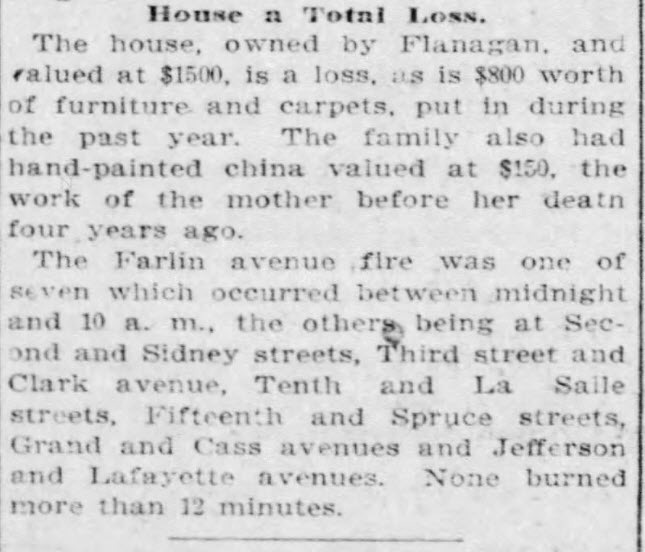 Their mother, Maggie Keville Flanagan, also from Ireland, died of uterine cancer in 1903. >>> Ethel, 9 years old when carried out by Nellie, wasn't actually the baby. Loretta, age 7, isn't accounted for in this story. >>> "Maud" should have been "Modie," the family nickname for Moses Rafael. 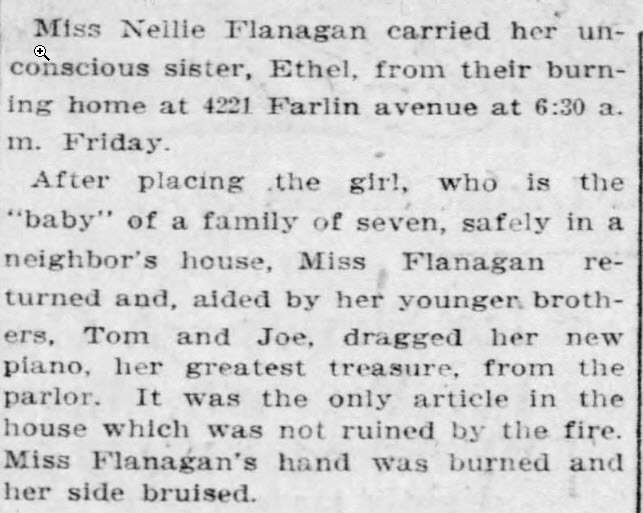 I was so thrilled to find this article about Nellie's passionate courage that it took awhile for the tragedy of that frigid January morning to sink in. Moses struggled mightily to provide for his "dreamer generation" children. They had music. They had art (note Maggie's painted china). One thing rescued from the ruins was an autograph book filled with love messages they wrote to one another. But the blows kept coming. Moses wound up placing the two youngest girls in an orphanage and they were institutionalized for the rest of their short lives. The boys came to no good and all died young. Nellie suffered her own tragedy and died at age 25. 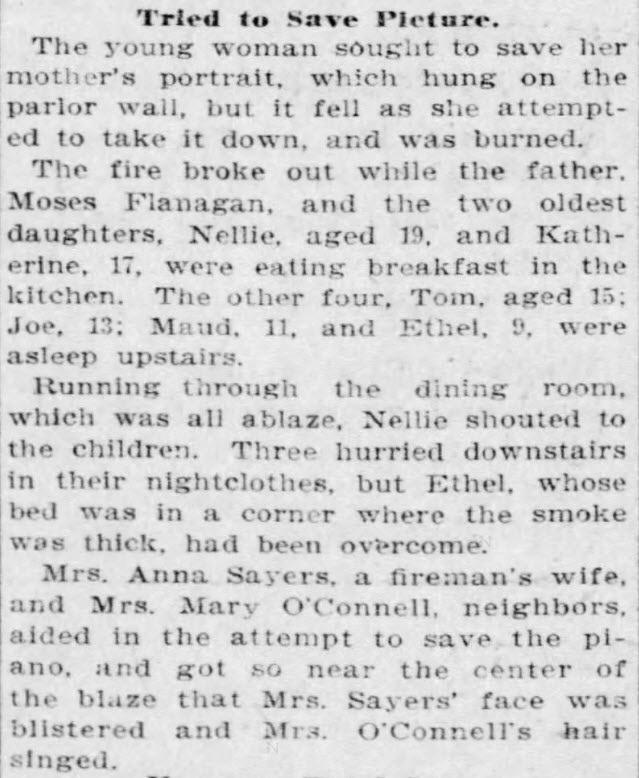 Of the seven children, only my grandmother Catherine survived to tell the tale.